"Pull the pin! I'm dyin' out here!" If I put the creator commentary at the beginning, will you still read it? Do you read it anyway? No matter. This is Hound from Transformers, Age of Extinction. You know, that movie that came out in July that had great cinematics but wasn't *really* Transformers? 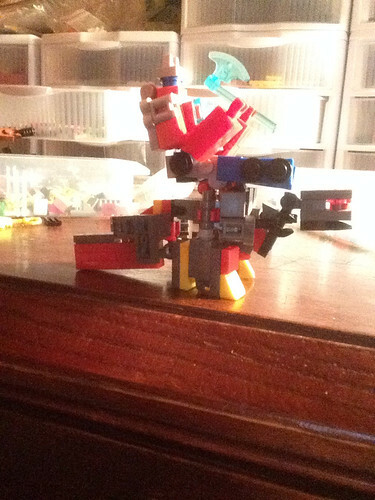 Hound was my favorite character, besides, of course, Optimus Prime so I built him. He transforms fully from fat robot to army truck (well the 'fat' thing didn't work well in the end but there's always a V2, right?) without the addition or removal of pieces (excepting the gun). It took me a while to get him to transform the way I wanted, and I don't really care if it's accurate to the movie version. As for color scheme, I don't have much Dark green in the parts that I need. If you want LDD instructions, let me know in the comments and I'll see what I can do. Prime Vehicle Mode comparison. They are about the same size. Here are all three in alternate modes. Grimlock is the largest in alternate mode but the shortest in robot mode. I love the way he turned out though. And all four together. Aren't they cute? No. And for your annoyance, here's a crappy picture of G1 Prime riding G1 Grimlock. Just to show how ridiculous it is. Thanks for viewing. Quoting Tigee152 Mcfig Could you post an LDD file for Grimlock? Could you post an LDD file for Grimlock? Quoting Chris . Nice looking autobot! Also great video, the truck looks just like him in the movie. Thanks! I've been working on this guy for a while so it's nice to know that he turned out looking good to others as well. It's cool. Just as long as you say I built it or whatever. A link to this page or my homepage would be nice but not required. Nice looking autobot! Also great video, the truck looks just like him in the movie. Thanks. I'll definitely have to get the parts in the proper colors. Maybe soon.